Samsung has announced the arrival of its new Freeview PVR – the BD-DT7800. The personal video recorder is one of the first by Samsung to be hooked up to its Smart Hub offering. The DT7800 has twin tuners, a 500GB built-in hard drive and it also offers the ability to edit TV programmes once you have recorded them, which means that you can trim them to length and cut out things like adverts. Because of its web functionality, the DT7800 can also act as a digital media server and there's also Samsung's All Share functionality on board as well as DLNA. As with many of Samsung's latest products, the company has added some 3D functionality in the form of a 2D to 3D converter – this is the same technology that can be found on Samsung's Smart TVs and latest Blu-ray range. 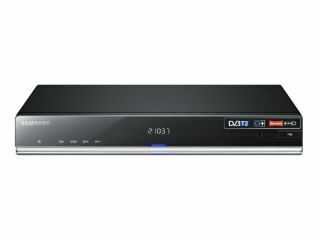 To go alongside the launch of the DT7800, Samsung is also offering cash back on purchases of the Freeview PVR and also if you buy a BD-D8900, BD-8500 and BD-D8200 Smart Blu-ray player or a SMT-S7800 Freesat PVR. Anyone who purchases these is entitled to £30 cash back. This offer begins 11 August, which is also the BD-DT7800 Freeview UK release date, with the box retailing for £279.